treeswift « Nothing in Biology Makes Sense! This week we have a guest post by Jessica Oswald a graduate student at the Florida Museum of Natural History at the University of Florida. She works on the biogeography of neotropical birds using fossil, ecological, and molecular genetic data. As an avian paleontologist, digging through fossils is to me like birding with a time machine. These fossils help us paint a picture of where modern forms came from and how different ancient species were from modern-day birds, especially intermediate forms. These outliers and in-betweeners are interesting because they hint at all sorts of morphological diversity that we don’t even know or expect, and give us a window into the past and how different diversity, communities, and climatic conditions and landscapes were from what we are familiar with today. This paper (Ksepka et al. 2013) on an early bird in the Swift-hummingbird clade does both of these things by exhibiting an odd morphology that we don’t see in modern birds, and helps us understand how the uniquely specialized wing shapes in modern swifts and hummingbirds arose from their common ancestor. 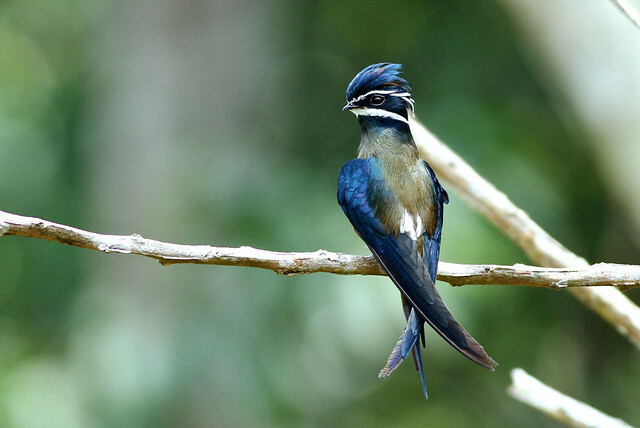 Members of the order Apodiformes: treeswifts (Hemiprocnidae), true swifts (Apodidae), and hummingbirds (Trochilidae), are aerial marvels. Swifts are able to reach the highest speeds during level flight (Chantler 1999) and hummingbirds are well known for their hovering abilities and their sideways and backward flight. Swifts and hummingbirds, while sharing the same wing bone characteristics, have different lengths of flight feathers, resulting in different wing shapes across the group, which allows them to perform their different aerial feats. Hummingbirds have shorter wings relative to their body size compared to swifts, resulting in their hovering abilities. These different wing shapes are well suited for their modern functions, but we have almost no fossils from this group, so we don’t know how the wing shapes diverged, or anything about the ecology of ancient species in this lineage.